A good friend of mine suggested that I add a Drink Something New component to this blog, and so I am! Sometimes you just feel like eating your favorites so why not mix it up when it comes to your beverage order? As far as I can tell this section will mostly consist of drinks of the alcoholic and caffeinated persuasions. I’m really excited about this and hope you enjoy it! I couldn’t have said it better myself. Their new-american cuisine is amazing, and is a must-visit any time anyone comes back to UD for a visit. It is a little “nicer” in terms of formality, but casual enough that it is fun and beers an burgers are a common pairing. They are a brewery so of course they brew their own beers. 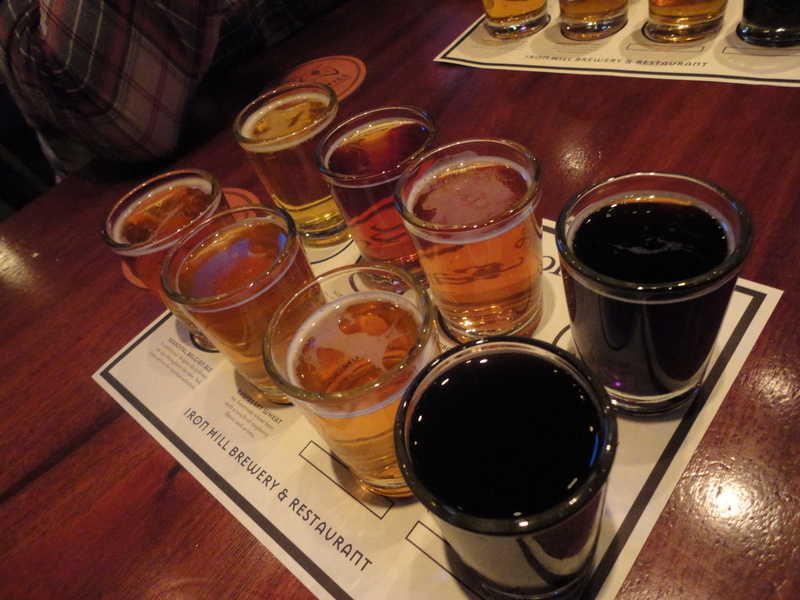 They offer a beer sampler, which I’ve ordered a few different times, but the most recent time was the best, by far – due in large part to our server, Rick at the Newark, DE location. The sampler starts with a paper place mat with eight circles on it, one for each of the samples. Then the server places each sample down one at a time and describes each one. Rick was awesome and way more thorough than any other server I’ve had explain it to me. He told us the name, the type of beer and the different ingredients. And any question I asked he had the answer to. It made it really fun and informative – an experience more than just a drink order. The number one reason why I think this beer sampler is so awesome is because it teaches you what kind of beer you’re in to. What I came away from it with was the difference between hoppy beers and more malted beers. From sampling these beers it reinforced the idea that Belgian white beers or ‘witbiers’ are my favorite – with citrus tones – think Blue Moon, Hoegaarden and Shock Top. My second favorite genre is malted beers – think Yuengling. So now, when I go out to eat and am in the mood to try a new beer (and let’s be honest, that’s 99% of the time) now I know what to ask in order to pick something I think that I’ll like.